This past weekend was a pretty big one in our house and it started with me back at home after being away for three days and getting in LATE on Thursday night. We had a sweet morning catching up, talking about my trip, eating breakfast outside and jumping it out on the trampoline. After that we set off for a morning FULL of errands. I had been so focused on school stuff and the trip that it hadn't really registered that Easter and birthday pictures for the kids was the weekend I got back so we set out on a hunt for a white polo and a pair of jeans that actually fit Luke because he has grown a TON! A pit stop for some fish watching and gelato to get us through our second round of errands. A trip to Whole Foods and I didn't have to push ANYONE! Friday night we headed to church for the Good Friday service and it was amazing! Griffin went to childcare, but the boys really "got it" and it was so neat to hear them remember and talk about all the details of the days leading up to Christ's crucifixion that we had been talking about at home and at school. They had stations of the cross set up and it was really impactful to get to see, hear and even taste the story leading up to Easter. After church we headed home for games, a movie and popcorn. ... and the kids loved them! 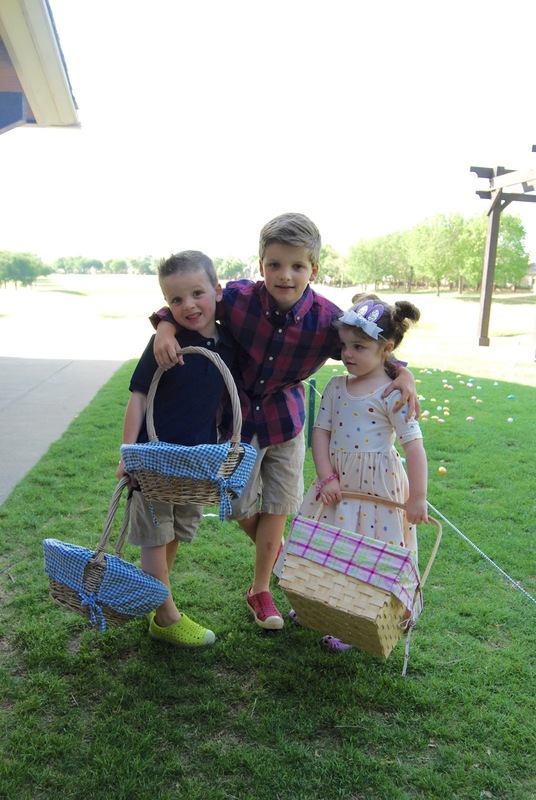 After baskets we went to the Easter Egg Hunt at the Country Club. It's one of our favorite mornings of the year and this year didn't disappoint! Last year Griffin did NOT like the Easter Bunny and she started worrying about him the minute we walked in. Poor baby! We were doing okay until the Easter Bunny came out to start the hunt and she absolutely panicked. Thankfully he went back inside and Luke helped her muster up enough courage to get out there. Such a good big brother! Last up was Luke and I attempted to get a picture of all of them while we waited - GG was still looking over her shoulder for the Bunny! Saturday night my mom and I met up with Narci to get a few pictures of the kids. Since they all have birthdays so close together I love to have pictures taken in the Spring so we can look back and remember them right as they were when they turned a year older. One of his presents was a light board so he can work on his tracing/drawing and he busted it out almost immediately! He requested cinnamon rolls for breakfast and we were all excited about it! The dress thatI had ordered for GG didn't come in so we went with her very favorite pink Remie Girl dress and called it a day - PRECIOUS!!! ... and the kids spent the majority of the day getting extra dirty outside while I worked in the kitchen. Dave got home Sunday evening and my parents came over for dinner. We grilled burgers and had the best time. Presents for the birthday kiddos! 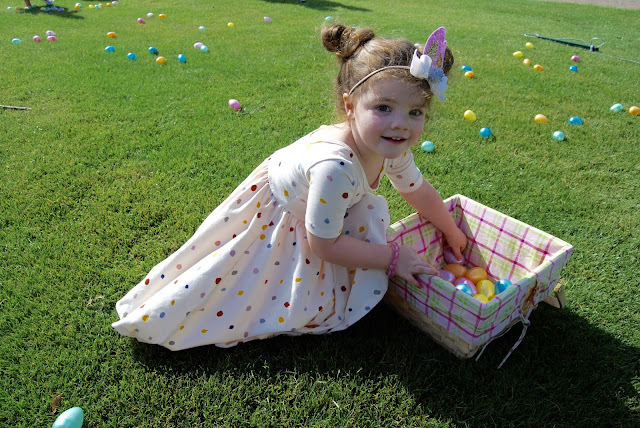 The Easter Bunny usually drops off a bag of eggs at our house Sunday afternoon with instructions on which color belongs to everybody and directions for Daddy to hide them. :) The eggs are filled with coins and this year there were three "golden eggs" that had bills inside. There were two with $1 bills and one with a $5 bill. They were each allowed to take one golden egg and they couldn't open them until we were done looking for the eggs. Mason was the lucky winner and I think he was pretty excited! ... and then it was time for cake. And in the spirit of birthday month Luke wanted candles too. What a great Easter weekend!! Poor G-hopefully next year she's over the fear of the bunny! I hope so too!!! She had this panicked look on her face most of the time we were there! A weekend filled with precious memories! The best kind! Speaking of memories - that video of carter and Brody?!?!?! Soooooo funny!!! Brilliant! Gosh, I sure wish we had thought of that! Would have made things so much easier vs. always trying to do it all in complete secret constantly worried they will see us working as the bunny! It's probably too late to switch it up now as my kids are the same ages as yours and it would likely cause more questions/confusion than it's worth. What a precious weekend. We will soon have three birthday kids in three weeks (and one lonely winter outlier). I love watching how you make it special for each of them and also celebrate together. What a fun-filled sweet weekend with your family. Thanks for sharing! So I thought having three birthdays within 6 weeks at Thanksgiving/Christmas time was a lot but you have me beat with the Easter/3 birthdays marathon. I was very impressed with the ease in which you switched gears from birthday to Easter and back again ; ) I hope there's a nap in your future this week! Do you have a link for the light board you got mason? My son would love it! I would definitely need a day to recover after all that fun and celebration! My birthday is in April and sometimes it falls on Easter too. So fun! I was glad to see your boys still use their "traditional" baskets with their names on them. I saw a lot of plastic pails and nylon pails this year at our hunts. Nothing wrong with those at all but I just like seeing the traditional baskets. Truth be told, they hold more eggs! Haha! Lots of candles at your house this month! Did you arrange the flowers on your breakfast table? Gorgeous colors! My sweet girl loves to draw like Mason. Have you heard of the You Tube channel Muffalo Potato? It's directed drawing and she loves it! Also, can you post the link of where you found the light board? I think Santa may be interested in that! Stations of the Cross is always the most poignant thing about Easter to me. Every year when I go, I always just bawl because it really makes me think about what Jesus went through for us. That's nice that the boys are now old enough to go and really understand it, too. Jacob (my five year old) has been doing a Lent journal where he has to journal the different stations of the cross, and I think he's starting to finally understand what it's all about. Love this Lent journal idea! Where is that bridge that you had the pictures taken at? We are in Allen and that looks like the PERFECT place to have my son's 2 year old pictures taken this weekend! Where is the bridge that you had the pictures taken at? We are local and that looks like the PERFECT place to have our son's 2 year old pictures taken this weekend! What a precious weekend! Your babies are getting so big.